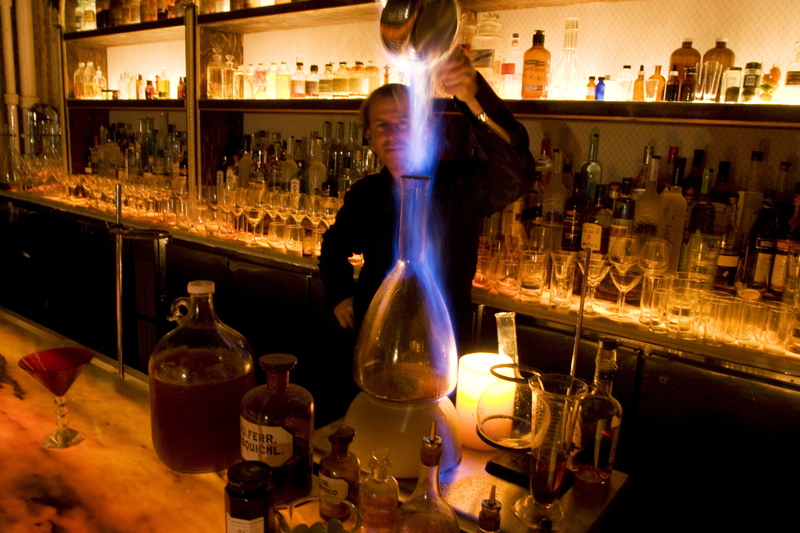 Looking for themed bars in NYC that are wonderfully weird (instead of just plain weird)? In a city where cocktail bars are a common setting, finding a scene that suits your taste and stirs up a unique vibe can be spiriting. 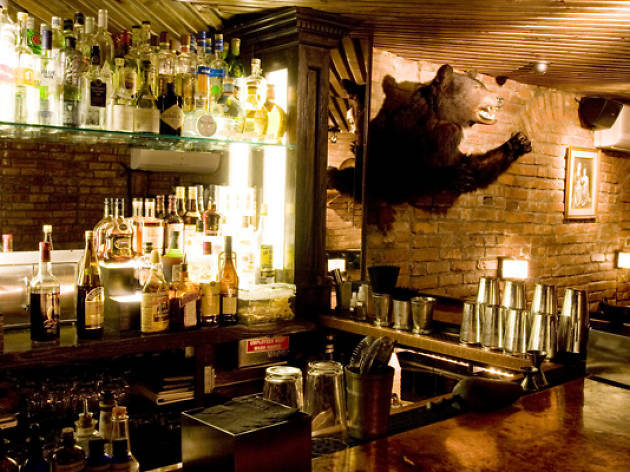 So take in a bar with a twist. 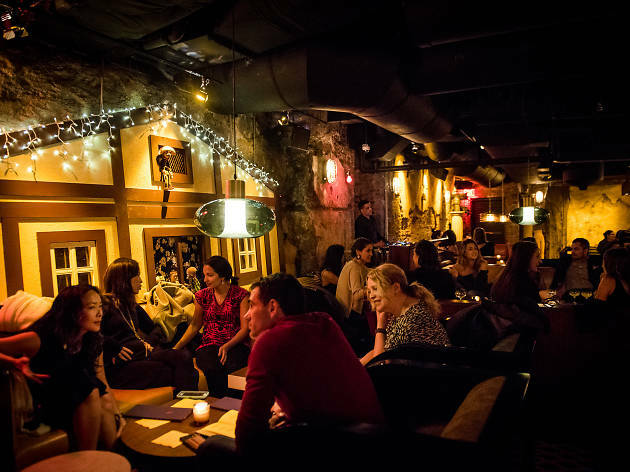 From special-access speakeasy bars to bars with games to dives doing their own thing, here are some wondrous and wacky places to patronize. 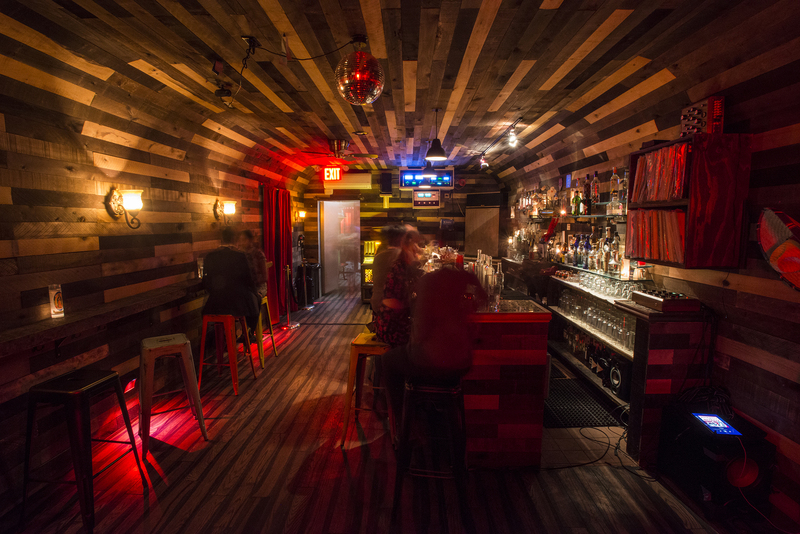 At this Bushwick corner tavern, you’ll find an edgy vibe, a sociable staff and quirky yet noticeably well-suited decor (let’s just say it’s titillating). 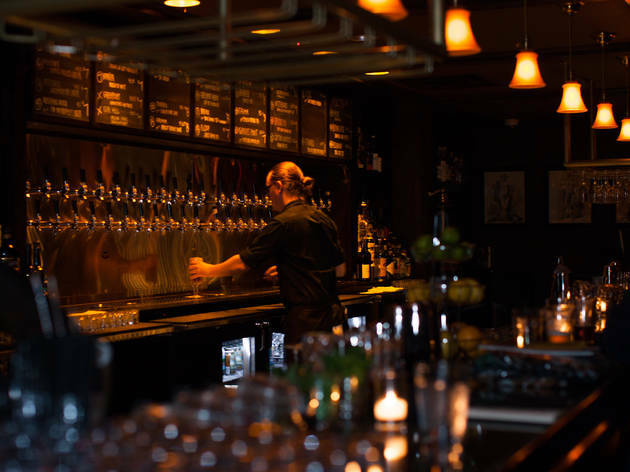 Drink prices are wallet-friendly, and long weekday happy hours extend to wine and drafts. Your inner child will happily break out here, as this dive bar has toys and classic board games that will attract patrons and friends. Chutes and Ladders or Connect Four, anyone? 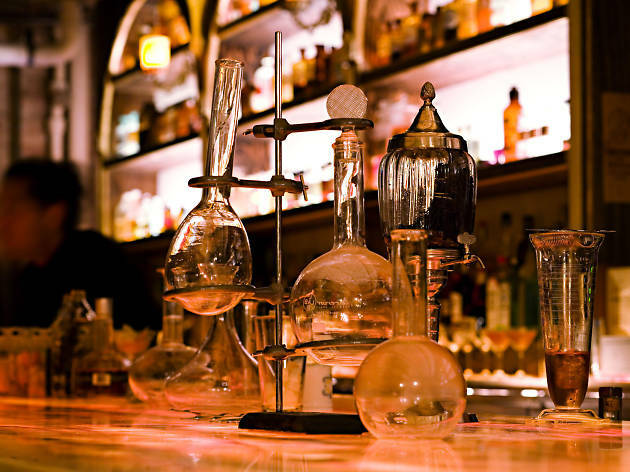 Don’t get shaken up by this pairing of mixology with macabre. 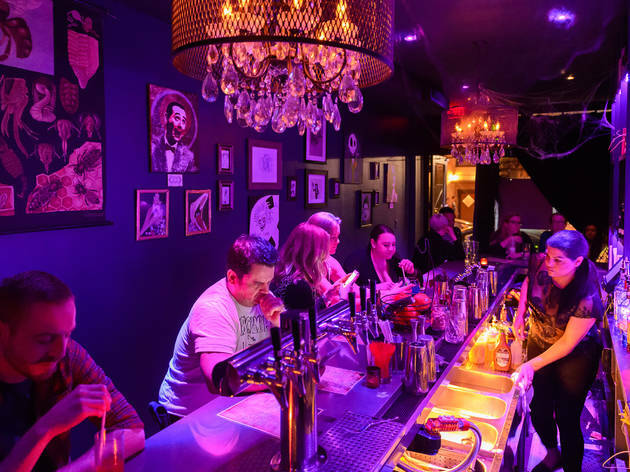 Based within the Alamo Drafthouse Cinema, this full-service, downtown Brooklyn bar holds pieces salvaged from a 19th century wax sculpture museum in Berlin. This panopticon, a form of entertainment from that era, presents life-size realistic displays of curiosities such as anatomic figures and death masks. You’ll also find Victorian decor and themed cocktails along with a fine modern selection of wines and draft, bottled and canned beers. 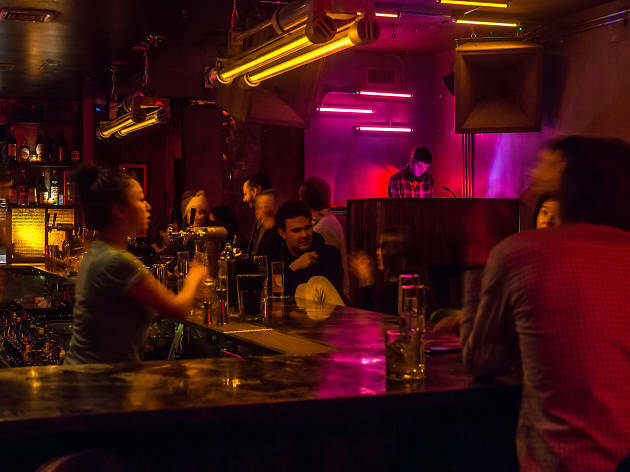 Sure, it has a silly name and proudly touts a midcentury dystopian sci-fi theme, but the industrial, LED-lit bar is much less a cheap play at Instagram likes than an earnest letter to the science-fiction genre. 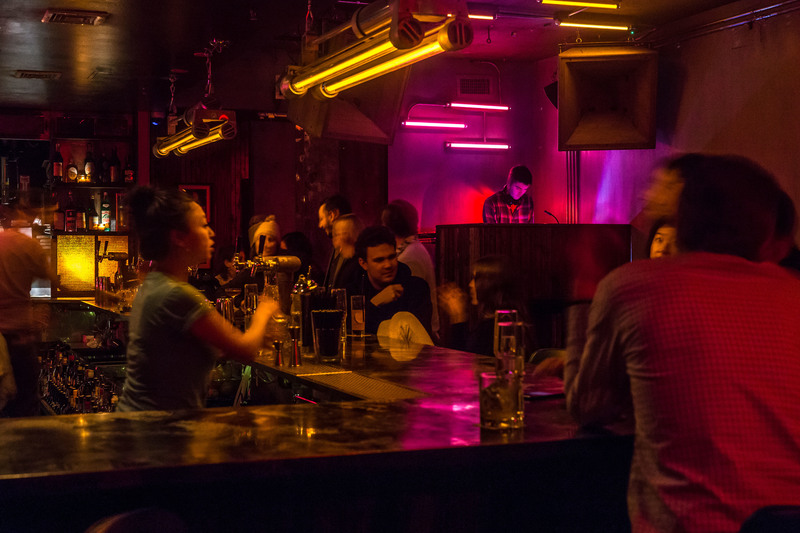 The bunkerlike space is outfitted with orange florescent lights, dark turquoise booths and nostalgia-inducing tech tchotchkes. 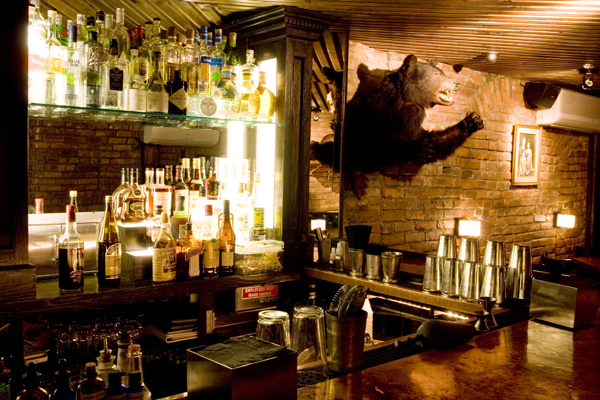 The Beekman Hotel’s underground lounge is located behind the door guarded by two suited bouncers and a blue-neon cat. Once inside, you’re immersed in restaurateur Serge Becker’s (the Box, La Esquina) space, which can only be described as performing arts meets Tokyo meets industrial chic. You know, that tired old theme. There are exposed pipes across the ceiling, puppets sitting atop a Tudor-style theater house, and Japanese-inspired cocktails and dishes (the latter from chef Tom Colicchio). The Mexican deli exterior in Williamsburg offers a hidden specialty behind its freezer door: a mezcal tasting and listening room. 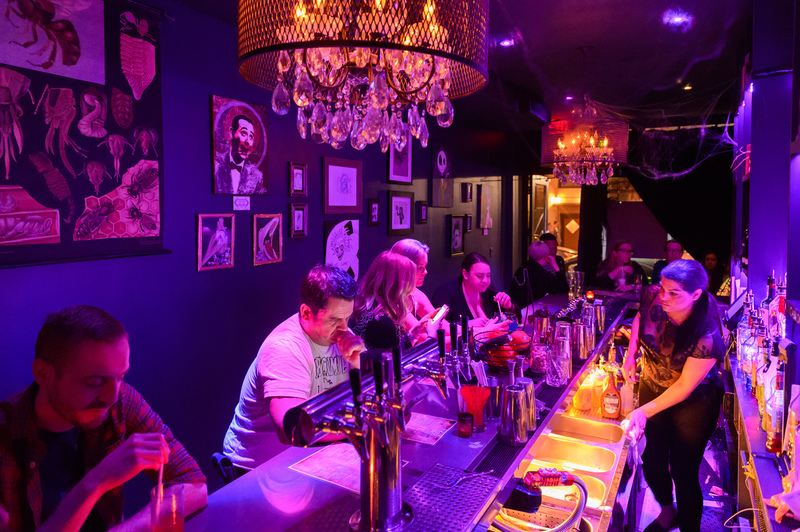 This speakeasy offers mezcal and tequila-based cocktails and agave spirits and a carefully curated music menu coming through a specialty Hi-Fi sound system. The selection is quite vast: blues, disco, reggae or just about any genre. A changing menu offers specialties from its Cerveceria Havemeyer, and required phone reservations are taken after 6pm daily. 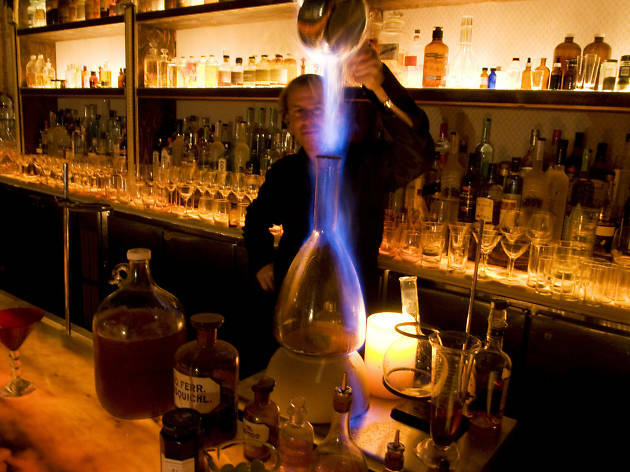 Along Chinatown’s Doyers Street, this popular back-alley speakeasy is shaking up alchemy and mixology within its European apothecary and 19th century Parisian absinthe den setting. 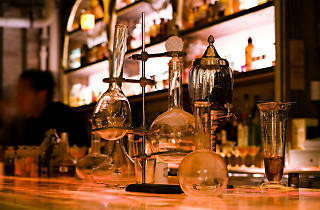 Bartenders in white lab coats mix up cocktails with ingredients made in-house with an experimental style. The menu lists drinks as remedies, with subcategories including Health and Beauty, Pain Killers, Stimulants, Aphrodisiacs and Stress Relievers. Prohibition-themed Wednesdays feature a password posted on their Instagram account, and the entertainment is rounded out with live music on Sunday through Thursday and a DJ on Fridays and Saturdays. 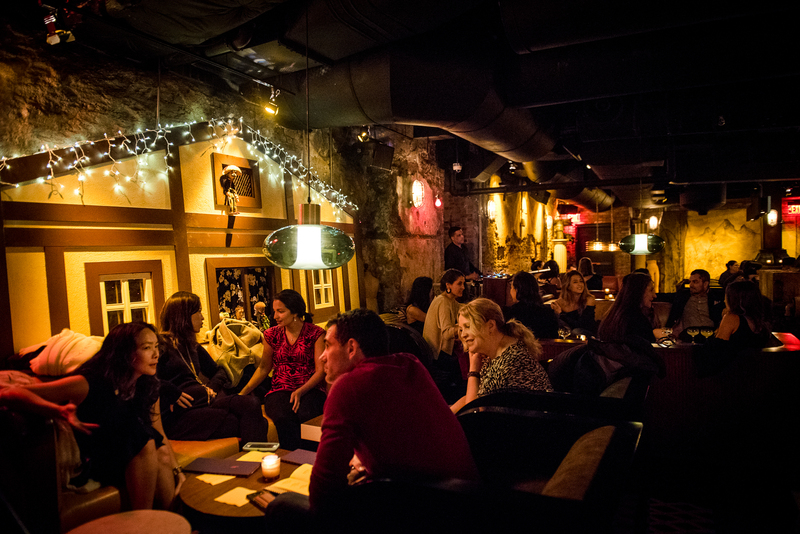 The initial location for this nightclub chain, this Gramercy salon turned vintage bar offers the perfect special for a girls’ night out: martinis and manicures. For $10, get your nails done while holding a cocktail in the other hand. Chrome-dome hair dryers are visual remnants of the venue’s past, and its current scene is buzzing with a heavily rotating event calendar. Spend your evenings dancing along to spinning DJs, getting laughs from comedians or being entertained by burlesque shows. 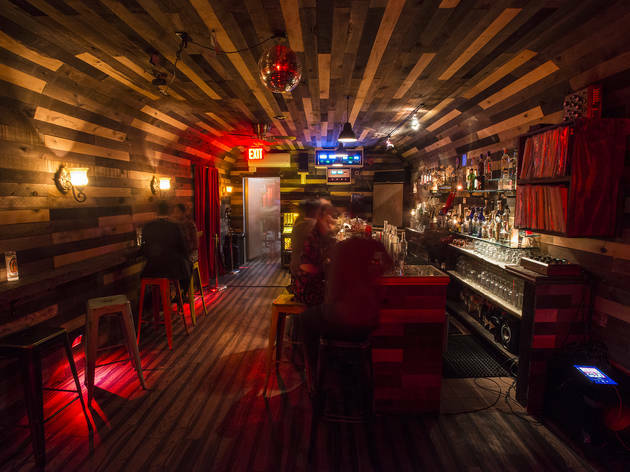 This East Village tiki bar has a Polynesian-esque ambiance and an eclectic mix of event bookings. The dive bar’s calendar extends to live music, movie nights, spoken word and comedy and variety shows. 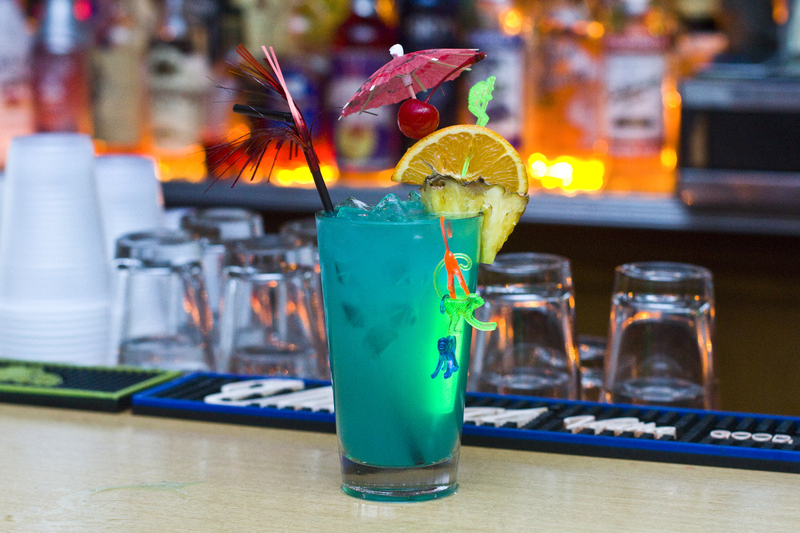 Of course, classic drinks like mai tais and house specialties come in funky mugs. One note: There is a $6 mug deposit. So while you sip, decide whether you’ll remember to return it or want to keep it as a souvenir. Fans of The Nightmare Before Christmas might not be able to get “This Is Halloween” out of their heads after a night drinking at this bar dedicated to all things Tim Burton. Walk through the black storefront to discover a barroom decorated with ominous-looking surgical equipment and faux gravestones. Getting into this speakeasy on St. Marks Place involves a unique gateway – entering through a vintage phone booth. As an annex to Crif Dogs, go inside the hot dog joint to come across this golden access area. Then pick up the phone and press a button. Upon admittance, discover a small and dimly lit space with taxidermy decor. Classic cocktails get some twists and innovative drinks also have their place, and for bites, order from the PDT menu or put in a special dog request from next door. 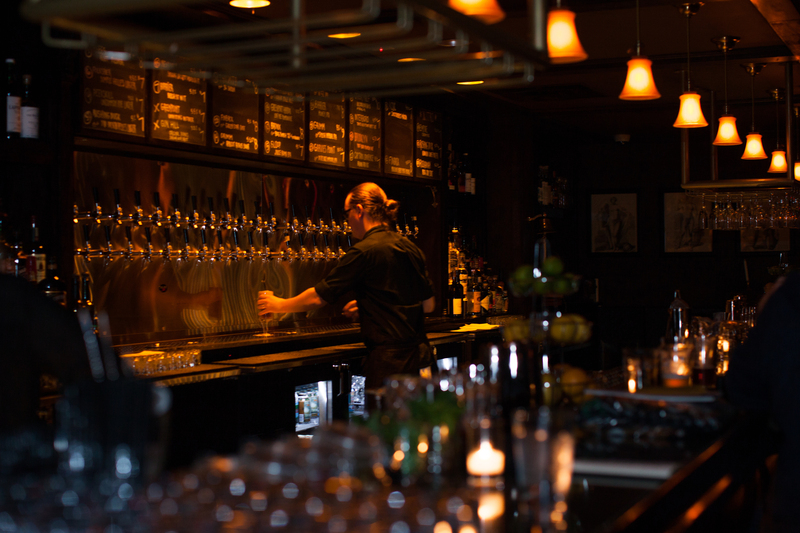 Tip: Get a handle on waiting by calling ahead for a reservation. 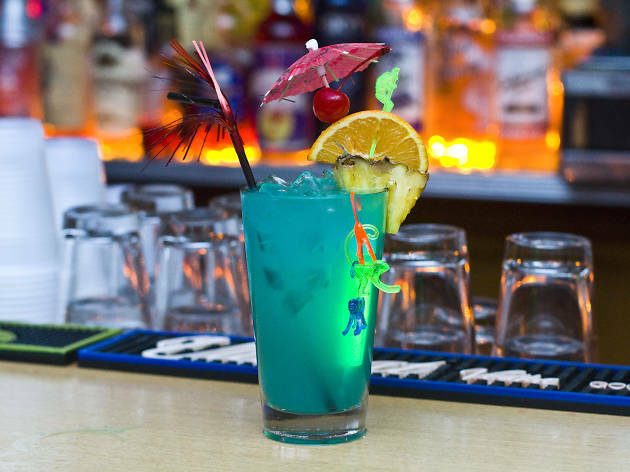 Looking for tiki and beach bars?